It was an exciting day for the children in Year Four as they ventured away from Earls Hall in order to enjoy the day at Layer Marney Towers. 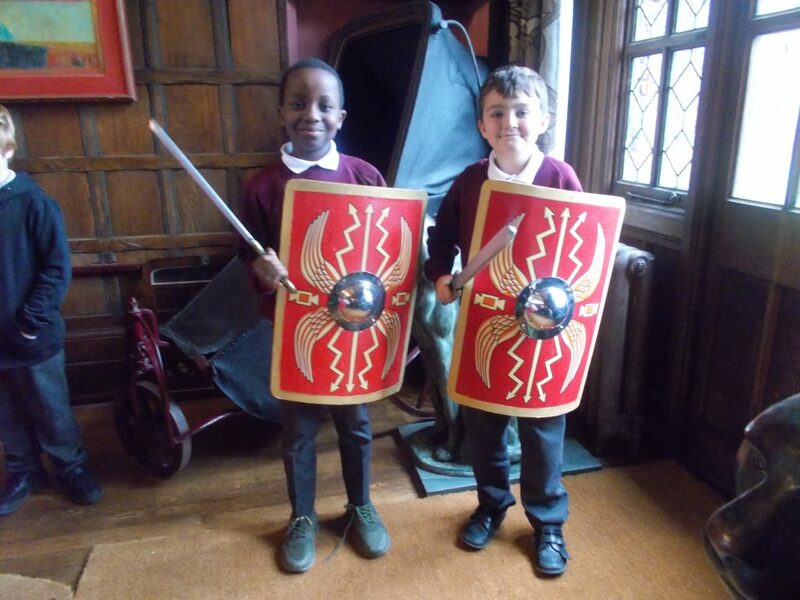 Even a grey and drizzly day couldn’t stop Year Four enjoying every minute of the Roman activities. The children learnt about the life of a centurion, dressed in the clothes of soldiers, rich families and slaves. They took part in role plays about Boudicca’s rebellion and created a mosaic necklace. It was all very good fun and a great day to remember. Meanwhile, there was more excitement of the sporting kind away from school as Mr Smith took teams of children to the Dodgeball Southend schools competition at Garons. The morning it was for the emerging teams and we took two teams that got to play five games each. Both teams won all their games and had great fun. The afternoon it was the competition and again we had two teams representing the school.Team B had four games in the first round where they started slowly but gradually got better in the second group, not losing a game. Team A won all their games in the first group then went through to the super 10s. Here they again won all the games played and now found themselves against Temple Sutton in the semi-final. We had to come from behind and won 2.1. Then they played Bournemouth Park in the final, these same 2 teams have contested this final for at least the last 3 years. Earls Hall completely dominated the final winning a brilliant 2.0. It was great to see so many of our children out enjoying Dodgeball and having so much fun. The children will now move onto the Essex finals in January. Well done to all of the children who took part, we are proud of you all! Back in school, the children in the Foundation Stage enjoyed setting up shops and role playing restaurants, handling real money in the process. The children in Year One took to the stage in order to run through some of the songs from their up and coming Christmas play and the children in 6J created their own Bodhi leaves, painting scenes from Kensukes Kingdom. At lunchtime the children enjoyed slices of Mrs Warren-Hardy’s delicious chicken pie and Mr B and Miss Bennett were joined at the centre table over in the Woodland Diner by children who had been identified displaying excellent manners. ← Storyboarding, Space & Science!